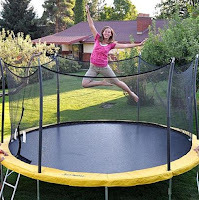 Sears Outlet is taking 50% OFF this brand-new 15-foot Propel Trampoline , complete with enclosure. It usually retails for $500, but now it can be yours for $250. It also includes FREE in-store pickup (delivery is extra). Just set it up and jump on it. That's it. My last time on a trampoline I did an eggbeater - that's where you sit cross-legged and hold your ankles while someone else jumps up and down. You, in turn, will bounce around (like an egg) until you break your hold. It's fun until your 250 lb. friend is the jumper. He flipped me pretty good and I landed on the ground... on my head. That's not to dissuade you from buying one. The enclosure will make sure you don't fly off onto the barbeque or whatever else is surrounding it. Click here to view the deal at Sears Outlet and to purchase.